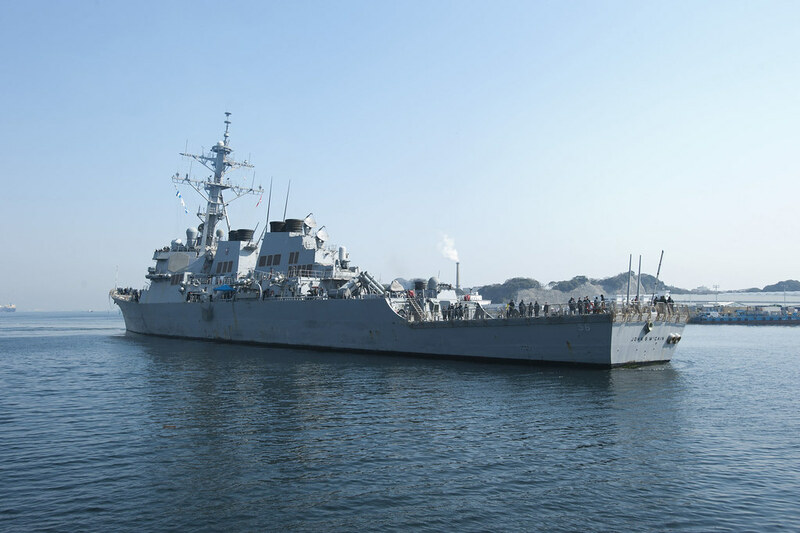 YOKOSUKA, Japan — Five ships forward deployed to Commander Fleet Activities Yokosuka were ordered to sortie May 28 to avoid Typhoon Songda. In anticipation of the storm’s projected arrival on early Monday morning on May 30, USS Blue Ridge (LCC 19), USS Fitzgerald (DDG 62), USS John S. McCain (DDG 56), USS Mustin (DDG 89) and USS Curtis Wilbur (DDG 54) departed from Yokosuka. Typhoon Songda is currently southwest of Okinawa with winds of 105 knots gusting to 130 knots, according to the Joint Typhoon Warning Center. The aircraft carrier USS George Washington (CVN 73) and the guided-missile destroyer USS Stethem (DDG 63) are both undergoing maintenance in Yokosuka and will remain in port. Commander, Task Force 72 repositioned three P-3 Orion aircraft from Kadena Air Base in Okinawa to Misawa Air Base in northern Honshu after Tropical Cyclone Condition of Readiness (TCCOR) 1 was declared. Commander, Task Force 76, usually headquartered at White Beach in Okinawa, temporarily shifted its operations to Kadena Air Base. Ships in Sasebo, Japan, are being closely monitored, but are not expected to sortie as sustained winds are forecast to remain below gale force. Several ships at sea also adjusted their tracks to remain clear of the storm. There are 60-70 ships, 200-300 aircraft and more than 40,000 Navy and Marine Corps personnel assigned to the 7th Fleet. This includes forces operating from bases in Japan and Guam and rotationally-deployed forces based in the United States. Commander, U.S. 7th Fleet, is embarked aboard the command flagship USS Blue Ridge (LCC 19), forward deployed to Yokosuka, Japan.